India has held a fascination for European travellers, artists, writers, explorers and photographers from the 5th century onwards. However until the last thirty years of the eighteenth century the European public had no visual idea of India, which was based on first-hand observation. Europe had been trading with India from the sixteenth century and during that time a number of traveller’s accounts had been published in England and on the continent. The line engravings illustrating such books had been made by professional engravers who never visited India. After 1770 the situation changed. Professional and amateur artists like the Daniells, William Hodges, Emily Eden, James Forbes etc. began to visit India and observe the country first hand. They made oil paintings as well as watercolors which could later be worked up into engravings. After the 1860’s photography became a popular medium for depiction of the Indian scene and also for documentation of important events like durbars and battles. 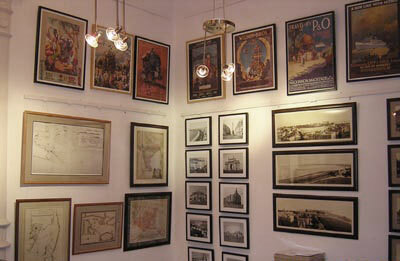 Professional photographers like Samuel Bourne, Francis Frith, Raja Deen Dayal etc. were active from the 1860’s onwards and provided an amazing body of work encompassing architecture, costume, maharajas, shikar etc. With the extreme scarcity and value of original material today it has become increasingly difficult to source original images. ‘Phillips Images’ offers, from the vast collection of Phillips Antiques, a collection of superior quality reprints of old maps, lithographs, engravings, aquatints, advertising posters and photographs, covering a wide range of subjects such as architecture, landscape, the Raj etc. These rare and evocative images printed on the finest quality of paper will be accessible to a larger audience by virtue of them being more affordable but still take nothing away in terms of quality and charm.